The Beauty Of Lead-Free European Crystal Without The Break-ability Or The Weight. The Large Bowl Directs Full-Bodied Wines Like Cabernet, Merlot or Bordeaux To The Center Of The Tongue To Balance Fruit, Tannin And Acidity. Elevate your everyday. Enjoy the beauty of European crystal without the breakability or the weight. Fusion Air melds handblown, lead-free crystal with magnesium to produce a glass that is strong, lightweight and remarkably break-resistant. You break it. We replace it. Free. In the unlikely event that your Fusion Air stemware breaks, we will replace it, free – even up to 10 years from the date of purchase. Simply call us and we will get the replacement process started. Learn more about our 10-Year Warranty. Fusion Air is thinner than the rest of the Fusion line, and markedly thinner than ordinary glass. The result is not just lighter-weight stemware, but a slim stem that is a pleasure to hold and a thin lip for easy sipping and savoring. Toast with the sonorous clink of crystal. Fusion Air stemware has shimmering refractive qualities that look great on your table as well as an amazing clarity for better appreciation of the color and viscosity of your wines. Air Fusion's visual design is a reinterpretation of classic forms for today's wine drinkers. The angles of the bell focus the aromas out of the glass, giving your wine a forward quality, making every sip more enjoyable. Fusion Air glasses are dishwasher safe and will never cloud or dull. Their break-resistant strength allows them to be hand-washed more safely than other crystal stemware. The broad bowl allows the delicate aromas accumulate and directs wine to the tip of the tongue. 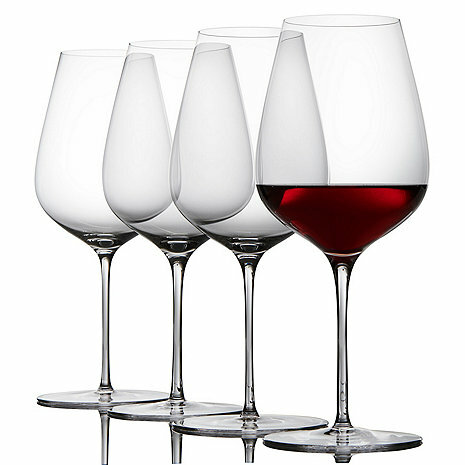 Designed for use with whites or reds, these glasses have a narrower bowl which reduces the surface area of the wine, allowing for a slower rate of oxidation. if you drop on concrete will they break ? BEST ANSWER: I have not dropped any of these glasses but have broken one. They are glass and can break; they just don't break as easy as other glasses. I think if you drop it on concrete, it will break. Haven't dropped mine on concrete but have knocked them over on a glass table with no damage. I would assume that dropping one on a concrete floor would result in breakage. Yes. They r just resistant to breaking. Primarily good with holding up if fall over in sink or on counter. how many ounces per glass? BEST ANSWER: Well...it depends how full you want your glass! These are big glasses though...not your everyday typical glasses. We use them for big reds and they are a treat to drink from. Will you be able to ship these glasses to INDIA? BEST ANSWER: Thank you for your International Purchase inquiry. Our international shipping has been simplified. Please visit our web site, choose the items and enter them into your shopping cart. Once in the cart go to the bottom of the checkout page and you will see a link for International Orders. This will take you to the processing site where you will see all applicable shipping fees, duties and taxes before you place your order. Click on the link below for a simple guide on how to proceed. Feel free to contact us with any further questions regarding your order. What size is this glass and is it Crystal? Lightweight magnesium fused with brilliant lead-free glass. The dimensions of the glass are 10" H 4- 1/8" Dia with a 29 ounce capacity. The glasses are made of lightweight magnesium fused with brilliant lead-free glass, not crystal. How big is the base of the glass? Will it fit in a 3 1/2" hanging wine rack? BEST ANSWER: Thank you for your question the base on this glass is 3-13/16" . We purchased the 'buy 6 get 2 free' Fusion Air Bordeaux wine glasses in April 2016. If a wine glass can be a work horse then that's exactly what you'll find with this glass. It is beautiful, graceful, and substantial. We use these as our everyday wine glasses and haven't been disappointed. Wine is beautifully presented in the glass and yes, we believe these glasses make the wine tasting experience better. These have now become my favorite glass, I use them everyday when I have a glass of wine with dinner. These glasses are very light, well shaped and concentrate the aroma's very well. I have not knocked one over to see if it will break, but with a 10 year warranty I know I will test that guarantee soon enough. I love the glasses, but unfortunately, the foot is very large. I have a wine glass rack where the glasses hang upside down by their foot. These glasses were to replace others in that rack that had broken over time, but the foot doesn't fit between the slats, so they sit in a cupboard instead of on display in the rack as originally intended. I particularly prefer light and delicate wine glasses, and these are eloquent and functional as I can use them for red and white wines. I am pleased with this purchase I no longer have to fumble around for the right wine glass. I just love the light weight and so far durability of these glasses! I will the opening was just a little larger in diameter but other than that these are the perfect wine glasses. I have used the Diva Tritan for years and wanted a replacement, perfect! As described. Very good quality. Well packed for shipping. I ordered four, and they all arrived in perfect condition. These have become my new favorite glasses! High quality and nice ring when toasting. One toppled on the counter and didn’t break! Love my new wine glasses. My company are very impressed. Great price, great glasses, great experience! I’ve bought a number of style of wine glasses over the years and the Bordeaux wine glasses i’ve recently bought are my latest favorite. The size of the bowl as well as the length of it allow for the fullest experience with a wine. The glass allows you to fully swirl the wine to get the most out of the aromatic qualities of a wine while allowing one to help air into the wine to get the most out of your experiences. The glasses are very pleasing aesthetically speaking, they really look great. They are the thinnest glasses i’ve ever used but are still very durable for the fine characters they posses. If they do happen to break which may eventually happen with any glass, Wine Enthusiast has always been very fair in replacing my previous purchases free with just paying S & H. Certainly a great value of a glass when compared to other producers and don’t forget they are lead free! Excellent. Super light weight and delicate as their much more expensive counterparts yet a guarantee of not breaking?? Or replaced?? Can’t beat that. I purchased these as a gift for a couple who both enjoy wine. The glasses are quite large, and seem fun and generous. They were delighted. I had researched these glasses online. I wanted a very specific shape and size and these fit the bill perfectly. Upon receiving them they are even lighter than I had imagined. Beautiful glasses. I will likely expand my air collection with others shapes in the future. I would definitely recommend these to anyone shopping for a high quality glass for reds. The design and quality seem excellent. We’ve been enjoying them for a few months and are pleased we purchased them. Great glasses! Perfect size and shape. A little fragile though. We ordered 8 and 2 were broken upon arrival. No worries though as Wine Enthusiast imediately shipped out two more after about a 2 minute phone call. Great experience so far! We'll be ordering 4 more to fill the cabinet. I love the lightweight feel, the shape of the glasses. However, 2 have snapped at the stem within 4 days of each other. Both are being replaced but it concerns me that the stem snaps off so easily with the 1st and 2nd use of the glasses. Very pleased with Fusion glasses for style and sizing. We have not had them long enough to address the breakage and reliability issues. Nice glasses. You have to be very careful when drying the glasses because the stems snap easy. But the 10 year guarenty will replace them!